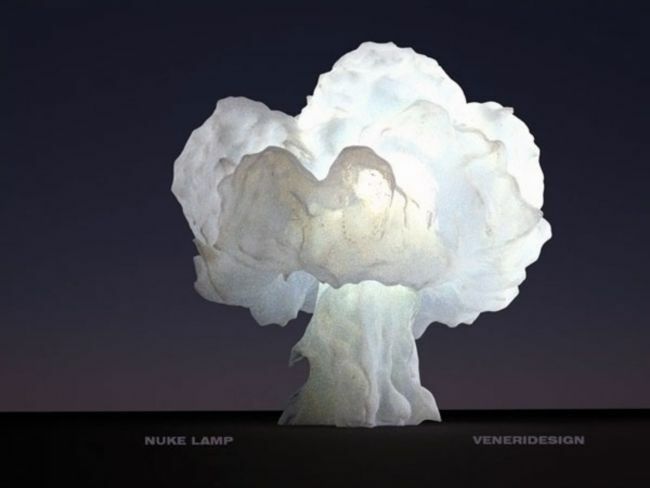 The Nuke Lamp: Does It Emit Radiation? The person to blame for this wonderful bedside illumination sculpture is Luca Veneri, a particularly gifted designer who wants to provoke his audience. Of course, “audience” in the context of industrial design is difficult to comprehend. People live around industrial design rather than ogle it for its artistic virtues. Still, having this on a table will inspire much wonder and headscratching, especially among people who think it’s a giant broccoli. It’s also a reflection on the owner, as having a mushroom cloud for home decor conveys a destructive streak. Mmmmmm, broccoli. Anyway, judging by the available photographic evidence, there’s a LED bulb embedded within the cloud. Don’t know how powerful it is, but its probably bright enough for some old school bedtime reading. That is, if you want a mini nuke cloud on your bedside table. It’s certainly good for those postapocalyptic novels that are all the rage these days. The material encrusting the exterior also looks a bit fragile. But maybe it had to for that mushroom cloud effect. When it comes to realism though, it would be cool if you scorch a table surface before placing this lamp. That way it gives the impression a small nuclear bomb did go off your in your bedroom. Having a Geiger Counter lying around won’t do any harm either.